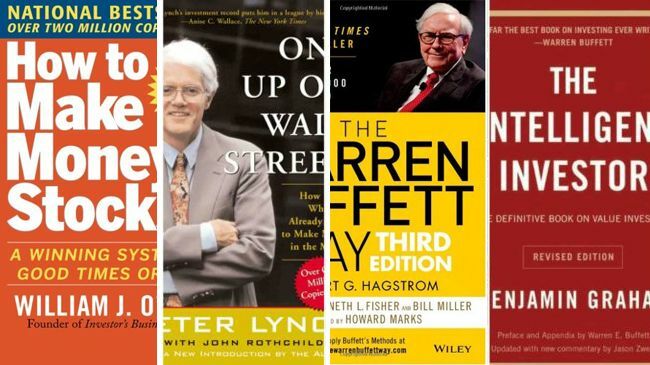 15 Best Books for Stock Market Investors – There are various sources to learn stock market like blogs, television, YouTube videos and books. Among these book is one of the best of learning source. Books helps beginners in gaining a basic knowledge, which is extremely important when you are new to stock market investing. Books also helps experts in learning strategies and skill requires for increasing their profitability. There are numbers of books available on the stock market. So, it is very difficult to identify best books for stock market investors. Here a is a list of 15 Best Books for Stock market investors along with brief introduction and review details. Starting from must read book to best seller every book is included in the following list. The Dhandho Investor is book written by Famous Investor Mohnish Pabrai. It is one of the simplest yet powerful book that I have ever read. In this book author talks about concept of “Heads I win, tails I don’t lose much” i.e. ‘low risk, high return’. The examples and case studies given in this book is very good. It clearly explains about investing in business with low risk and high returns. Over all this book is must read for the investor with basic understanding of stock market. The Intelligent Investor is a book for Intelligent Investors. It is written by Benjamin Graham. Benjamin Graham is a mentor of stock guru Warren Buffett. Fundamental of stock market investing and value investing is explained very well in this book. This book also explains about three different approaches for defensive and aggressive investors. This book also contains detail information about a margin of safety, market behavior and risk management. It is one of the oldest book which explain about basic as well as advance stock market investing concepts. It is highly recommended book for the stock market investor. There are many ways to make money in today’s market, but the one strategy that has truly proven itself over the years is value investing. This book purely talks about value investing. In this book author gives analogy of supermarket shopping to explain concept of buying stocks. It also explains about value investing concepts like diversification of stocks, creating a margin of safety, preferring value over growth, shareholding, insider’s buying or selling pattern etc. This is one of the best book for learning about protecting and growing your capital. This book also comes with audio CD. One Up on the wall street is one of the highest selling book written by Peter Lynch. Peter Lynch is a most popular stock market investor in America. This book explains all basic stuff that beginner need to know before entering the stock market. Peter Lynch has also mentioned about winning stock picking strategy in this book. This book also describes 6 different type of stock categories in detail. It is highly recommended book for the beginner planning to invest money in the stock market. Common Stocks and Uncommon Profit is written by Philip A Fisher. It is one of best book on stock market investing. This book talks about a multibagger stock. It also explains that if you find a good stock and hold it forever it will give you massive gains. It also gives information about 15 Points to Look for in a common stock. The best part of this book is this book help in understanding about What to buy, where to buy and when to sell. The Warren Buffett Way is a book on the investment strategy of Investment Guru Warren Buffett. The author of book Hagstrom explains about every investment style of Buffett that can be applied to your stock portfolio. If you want to become wealthy by following Buffett you should read this book. Beating the Street is another good book by Peter Lynch. It is an excellent book for individual investors looking for value investment opportunities for a long term. This book explains fundamentals of selecting a stock in simple language. If you are planning to invest in the stock market by yourself you should read this book. The little book that beats the market is the smallest book in the list of 15 best books for stock market investors. This book is written by Joel Greenblatt. It is New York Times best seller book. This book explains key factors Earning Yield and Return on Capital for the selection of stocks. It also talks about buying above average companies at below average price. Stocks to Riches is a book written by Indian Author Parag Parikh. This book explains Indian Stock market and behavior of Investors in simple words. This book also describes common mistakes by a beginner in the stock market. If you want to avoid a stock market mistake, you should read this book. It is written in a manner that even common man with less education can also understand. That is the reason this book is on the list of 15 Best Books for Stock Market Investors. Learn to Earn is a book written by Lynch. It is one of the best books for the stock market investors. This book gives basic information about market, economy, capitalization etc. It also highlights lot of facts about investing and business. It is a must-read book for the beginner in the stock market. As the title suggest this book focus mainly on way to avoid loss and earn consistently form the stock market. The author of this book is Prasenjit Paul. It is about Indian Stock market scenario and winning strategies to beat the stock market to earn decent returns. This book give insight above when to buy and when to sell. It also provides quick formula for picking winning stocks. Stocks for the long run is a book written by Jeremy Siegel. This book explains the advantages of holding stocks over a long term. It also gives an explanation about historical returns on stocks and bonds. The odd part of the book is it explains old history of US Stock market, economy of china and global markets. Overall, it is a very good book for learning various things on the stock market. Warren Buffett letter to shareholder is book which carries collection of letters written by Warren Buffett to the shareholders. The book is very costly. However, it is worth to learn from the world’s greatest investment guru. This book contains past 50 years of Warren Buffett’s letters to the shareholders of Berkshire Hathaway. It is one of the best book. I have not read this book but gone through the review given by the readers. Value investing and behavioral finance is book written by famous stock market investor Parag Parikh. This book explain that how behavioral traits helps investor in earning more money. This book nicely explains that, it is very important to buy good business (not stock) at reasonable price with long term horizon and being patient. It is must read book for stock brokers, bankers, portfolio manager, fund manager, new investor and student of finance. This book is written by William O’Neil. This book describes about CAN SLIM – A winning system in good times or bad. It combines fundamental and technical analysis and it is very good guide for new investors. This book also provides proven techniques for finding winning stocks before they make big price gains. I hope the list of 15 Best Books for Stock Market Investors will be extremely useful to you in the selection of a right book for the reading. If you think I have missed any book on the list or if you want to include any additional book in the list, I request you to add it in the comment section given below. U shud have also added Security Analysis By Benjamin Graham..!!! !